It may have been your dazzling skills and qualifications that landed you the interview, but when it comes to landing the job, an on-point outfit will most definitely help. Let's face it: Between worrying about those dreaded curveball questions to fretting over résumé fonts, a job interview is stressful enough—you shouldn’t have to sweat your outfit, too. That’s where we come in. We’ve seen countless interview ensembles in our day and at this point have reduced what works (modern suits) and what doesn’t (maxi skirts) down to a science. Click through now for our tips and affordable shopping suggestions so you can lock down the interview look that will surely win you the job. Have your interview outfit perfectly planned out, but still have to brave winter weather to get there? Let this cold-weather outfit guide you to looking polished. 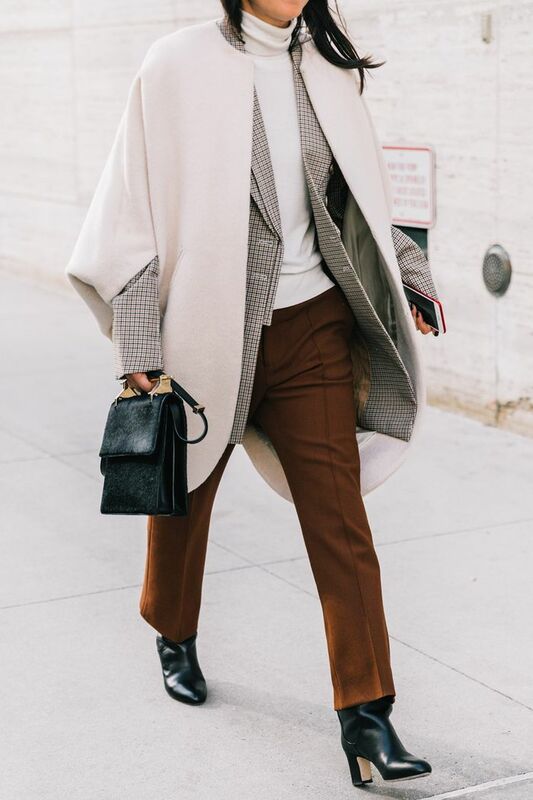 With suiting separates, add a simple turtleneck underneath your blazer and opt for a tailored wool coat to wear over the whole look. This is how we imagine the French would approach an interview outfit. Worn with wide-leg pants, a brown blazer can look just as professional as a black one. Finish off the look with neutral heels. Not all interview outfits need to adhere to a neutral palette. Show off your personality through an unexpected color, but keep the pieces professional. A pink suit like this one could be a great option for those applying into creative roles. Luckily, there are so many fun colored suiting options for spring. Available in sizes 39 IT to 41 IT. Sometimes wearing all black can come across as too severe. In that case, we recommend varying shades of lighter neutrals like white, cream, and beige. Try a brightly colored top to accent the neutrals. When in doubt, this combination is pretty much foolproof: crewneck sweater + wide-leg cropped trousers + heeled mules. Another great way to show off your personality while maintaining a totally professional look is the through the shapes and silhouettes you wear. Instead of a classic pencil skirt, try out a midi skirt with an asymmetrical hem. Not all interview looks need a blazer, either. A polished blouse and well-fitting trousers are always a winning combination. Depending on the office dress code, pair these with a button-down shirt or your favorite white tee. Swapping out a blazer in favor of a biker jacket is a bold move—we only recommend it for a creative job environment and if you keep the rest of your outfit rather buttoned up. Available in sizes 36 IT to 40 IT. Get away with a bold print by restraining the color palette to black and white. For the most part, you should toe the line with classic, tailored pieces, but adding one piece with a punch of personality, like a pair of colorful snakeskin pumps, can make you stand out from the pack. One piece of statement jewelry can show your personality in a good way, especially if there’s a story behind the piece. Don’t get too complicated with bulky layering. A simple button-down shirt + sweater + jacket combination is always a surefire bet. With 13 foolproof options to guide you, you'll show up to that interview ready to land the position. This post was published in 2014 and has since been updated by Anna LaPlaca.